Strategy is neither a part of mind, nor is it a part of matter. It is a third entity which is independent of the two ... even though strategy cannot be defined, you know what it is. As a definition that is a little devious maybe; but strategy, like quality, has that characteristic of meaning so many different things to so many different people. One of the best definitions of strategy is certainly that of Colonel John Boyd, but let’s leave that definition until the page on strategic advantage. In the measurements section we found that we needed to define; the system, the goal of the system and the necessary conditions to support the goal. We called these our rules of engagement, but in effect we were defining the direction of the company. Let’s use the direction of the company as a simple definition of strategy. In a similar way Caspari and Caspari suggest that strategy is an organization’s path to the future (2). However, this leaves out an important question. An important question that might easily remain unanswered if not asked – why change. Let’s add this to our process of change for a more complete approach. Once we add this initial step we can use the process of change for whole company strategy as well as operational problems. Answering the question “why change” tells us something about the direction of the company, even if that direction hasn’t been clearly articulated yet. “Why change” is a result of the dynamic tension between where we are now and where we want to be in the future. Sometimes we don’t even write down where we want to be in the future, we just “feel” that we are not doing the right things now in order to be in the right place in the future. So, step 1 tells us about the desired direction of the company. Steps 2, 3, & 4 tell us about the direction of the solution to how to implement it. (1) What is the direction of the company? (2) What is the direction of the solution? Let’s use a truck analogy to explain this better. Consider for a moment an articulated truck, the sort that is common in North America but almost non-existent in Japan. You may know them as “semi trailers”, or “tractor and trailer”. The key point is that the cab is connected to the trailer through a frame-mounted pivot above the driving wheels. The cab is articulated with respect to the trailer. Let’s consider the cab to be the “direction of the company.” The driver turns the steering wheel the direction of the cab changes in accordance. The trailer, which we will consider to be the “direction of the solution,” usually just follows on from the direction taken by the cab. Articulated trucks sometimes however have a small problem, the momentum of the trailer is greater than that of the cab. If the cab makes a sharp change in direction (and speed) the trailer will jack-knife – and very likely both cab and trailer overturn. That is to say that if the direction of the solution isn’t built in accordance with the direction of the company, or if the direction of the company changes suddenly then you too might find that your strategy – like an articulated truck – has jack-knifed. How do we go about formulating a strategy then that avoids such a situation? Well, we use our 5 focusing steps for that. Here they are modified for strategic constraints and using the language of leverage points (3). (1) Select the leverage points. (2) Exploit the leverage points. (3) Subordinate everything else to the above decision. (4) Elevate the leverage points. (5) Before making any significant changes, Evaluate whether the leverage points will and should stay the same. Using the focusing process and buffer management we can be assured that we will be aware of emergent problems within the direction of the solution before they become real constraints. We can make considered and proactive (strategic) investment to maintain or change the location of the constraint consistent with maximal long-term benefit to the firm. While this accounts for no sudden surprises in the direction of the solution, we also need to check that the potential leverage points are consistent with the stated aim or goal in order to ensure that there are no sudden surprises in the direction of the company. There are two approaches for doing this. There are two different approaches to strategy formulation within Theory of Constraints. Both make extensive use of the Thinking Process. How much of the Thinking Process appears visible to the participants depends upon the person who is providing the collaboration. 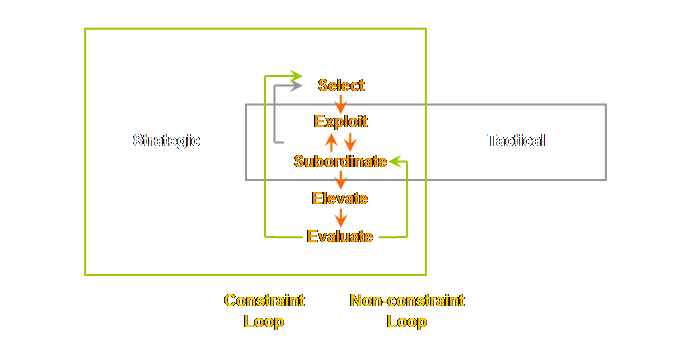 (2) The Constraint Management Model for Strategy. Let’ examine each in turn. Many companies have a pressing operating or marketing/sales problem. They desire a quick and immediate solution. The temptation in the past has been to provide the training for the necessary logistical or non-logistical solution to gain immediate relief. However, most often this simply moves the problem – the constraint – to a new area, an area that was previously not aware that it was a problem. What is this likely to produce? Resistance! Rather than have a haphazard step-wise process, it is better to develop a system-wide strategy and tactics at the highest level at the beginning in order to deal with emergent constraints before they become a reality. This is the focus of the holistic approach (4). In effect, aligning the direction of the company and the direction of the solutions. The “why change” in the holistic approach is generally contained within the 8-set self learning program CD-ROMs. But one could also use Goldratt’s novels to the same effect – it just takes more time. These present the current status in a generic and non-threatening way and create the desire to move in a systemic/global optimum direction. The Thinking process, especially the use of the 3 cloud method and communication current reality tree is the key tool in obtaining the alignment on what to change, what to change to, and how to cause the change. One might say that in this instance the general direction of the company is, initially, well known but the direction of the solution, and its implementation is not known. Other organizations – not-for-profit especially, may find it difficult to initially verbalize the direction of the organization/company, and without a coherent unified direction of the company it is impossible to nail down the direction of individual solutions – be they Theory of Constraint-based or otherwise. This is the focus of the constraint management model for strategy (5). The constraint management model for strategy addresses the question of why change through the use of a strategic intermediate objectives map – essentially a cause and effect diagram of the absolute necessary conditions required to enable the organization to move towards it’s goal. The beginning of what to change is obtained by determining the mismatches between these essentials and the current reality. The current reality tree is the tool that achieves this. The constraint management model for strategy allows you to “bring your own” direction for the company and maybe your own solutions as well. It uses the intermediate objectives map and current reality tree as key tools. (4) Diagnostic Control Systems – critical performance variables. The Theory of Constraint logistical solutions, buffer management, constraints accounting, and the thinking process (especially the holistic approach and constraint management model for strategy) provide the mechanisms to pursue this original framework. Develop your strategy first – and tactics will follow and flow from it. If you develop your tactics first you will stall within a couple of iterations because the whole organization will not understand the direction that a part of the organization is trying to take (force). We need a systemic/global optimum approach to our strategy as well as to our tactics. (1) Pirsig, R. M., (1984) Zen and the art of motorcycle maintenance: an inquiry into values. Bantam Books, pg 240. (2) Caspari, J. A., and Caspari, P., (2004) Management Dynamics: merging constraints accounting to drive improvement. John Wiley & Sons Inc., pg 257. (3) Newbold, R. C. (1998) Project management in the fast lane: applying the Theory of Constraints. St. Lucie Press, pp 149 & 152-155. (4) Goldratt, E. M., (2002) The TOC Self Learning Program. 8 set program. Goldratt Marketing Group. (5) Dettmer, H. W., (2003) Strategic navigation: a systems approach to business strategy. ASQ Quality Press, 302 pp. (6) Hammond, G. T. (2001) The mind of war: John Boyd and American security. Smithsonian Institution Press, pp 172-173. (7) Simons, R., (1995) Levers of control: how managers use innovative control systems to drive strategic renewal. Harvard Business School Press, 217 pp. (8) Simons, R., (1995) Control in an age of empowerment. Harvard Business Review Mar-Apr, pp 80-88.